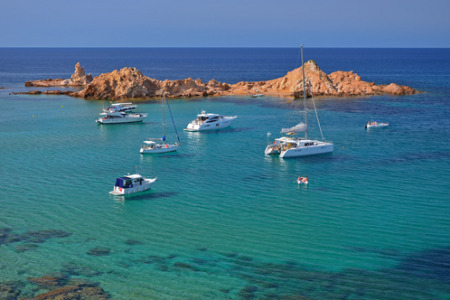 Holidays to Cala Alcaufar take you to a traditional fishing village on the southern coast of Menorca, five kilometres from the principle town Mahon. It is a particularly quiet resort with only one hotel and lots of villas. Holidays in Cala Alcaufar are very popular with families as the beach is a long inlet that provides very safe conditions for young children. Couples, and those who enjoy walking, are also attracted to the area. Cala Alcaufar holidays can be taken from April until the end of October when temperatures rise from twenty to low thirties in the height of the season. If you are seeking a place where nothing disturbs the peace, you may be interested in one of our cheap Cala Alcaufar holidays which are considered to be great value. Since there is only one restaurant and one shop in this sleepy little backwater, car hire is recommended if you wish for a greater choice of goods and menu. Our Cala Alcaufar holiday deals fly from the shelves. In order to avoid disappointment, you need to book early. To find our best Cala Alcaufar holiday offers, please use the search facility.